Oh my! This book is crazy! 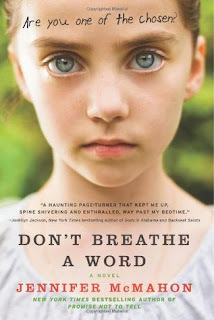 I requested Don't Breathe a Word by Jennifer McMahon from a Shelf Awareness campaign. I didn't know much about it other than there was a missing girl and rumours of fairies. It sounded mysterious so of course I wanted to read it. Phoebe is in love with Sam, a man whose sister disappeared 15 years earlier. The local kids believed Lisa was abducted by fairies she had been communicating with in an abandoned village in the woods surrounding the town of Harmony. Sam believed she was kidnapped by some pervert hiding in the woods. When a frightened girl calls Phoebe and leads her to a mysterious Book of Fairies, she starts doing a little research of her own trying to piece together the events that lead to Lisa's disappearance. The story alternates between Lisa at 12 years old and Phoebe in the present time just after the book is found and her happy life is turned upside down. Phoebe never had it easy. Her mom was an alcoholic who neglected her. Phoebe grew up having horrible nightmares about a shadowy figure hiding under her bed. Fifteen years earlier, she was drawn to Harmony during the hoopla surrounding Lisa's disappearance and ended up staying. Eventually she met Sam and they started a life together. His family seemed like the perfect opposite to her own until Lisa disappeared. Lisa is an imaginative child who believes fairies are leaving gifts for her. She becomes obsessed with the woods behind her house, leaving treats for the fairies. Lisa wishes to run away to the land of fairies, a happier alternative to her present situation. After a trip to the beach, the family returned home to find her father had overdosed. Now he lives in a haze and doesn't speak. Her Aunt Hazel and cousin Evie moved in to help out but her mother and Hazel have 'whisper fights' and act secretive. Both Phoebe and Lisa learn that nothing is as it seems, as does the reader. The plot twists and turns. I wondered what the heck was going on. And just when I thought I had it all figured out, I was bamboozled! Since I read the book in just one day, obviously it has quick pacing. I was on the edge of my seat wondering how it would all end. I was left with so many questions, trying to figure out what was true and what was a lie. Told it third person but from the point of one character at a time, the reader knows only what that character knows. During Lisa's story I believed what she believed. She was so innocent, I just wanted to hug her. With Phoebe, I wasn't so sure. There was a mixture of skepticism and belief that Phoebe struggles with. Sam plants doubt in her mind since he is such a rational person. At times, Sam bothered me though. When you read the word fairy, you might think of little critters hopping around on toadstools. The fairies in the book are more ambiguous. Are they real or imagined? Don't Breathe a Word is more of a thriller with supernatural elements than a fantasy story. Still, it's super creepy and you might not want to read it alone at night (like I did). I've been seeing this around, but yours is the first review I've actually read to the end. I didn't know much about it; only that the cover (for some reason) kinda creeps me out a bit! I think it's those big eyes.... Anyway, you've made it sound so fantastic, I have to get my hands on a copy. Great review Chris! I'm with Heather...the cover creeps me out. It's definitely the eyes! Great review. I love the cover, I've read many reviews for this book, but never heard anyone say it was creepy or scary even, so now I know I need to have the nightlight on when I go to bed after I read it. I think it sounds like a great story. Thanks for sharing your review. Heather & Jill- I think some Photoshop magic was applied to that cover. Those are some big eyes. Lena- Maybe it's just me. lol! I always had a thing about people lurking under the bed. The cover is super creepy! Torchwood did an episode with fairies and they were some creepy individuals. I will check this one out for sure! The cover of that one made me think this book is creepy. It sounds sooo good. I SOOOOO want to get hold of this book. It looks great -- even though I typically steer clear of "faery" or "fairy" books. The creep factor is what's drawing me in on this one. LOVED this book! I devoured it in a day or two. I think the fairy description tends to scare people away, which is SO unfortunate. I love how it keeps the reader guessing. ah yes, the creepy cover i keep seeing pop up on peoples blogs! if the book is half as creepy as the cover, i'm not sure i'd like it. i'm a wuss. I really need to read a Jennifer McMahon novel. This sounds really good.